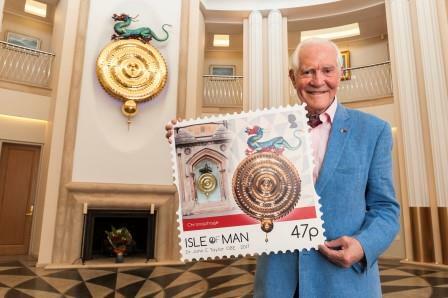 The issue, Invention and Innovation – Dr John C Taylor OBE, features six stamps showcasing some of the Isle of Man resident's greatest personal and professional achievements. The intricate designs mirror Dr Taylor's painstaking attention to detail, and incorporate graphic elements reflecting his work and special varnish and metallic ink print finishes. Isle of Man Post Office has worked closely with Dr Taylor, to ensure the subjects covered and the issue itself have his personal approval. Dr Taylor was born in Derbyshire in 1936 and, after being evacuated to Canada during World War II, he was educated in the Isle of Man before attending Corpus Christi College, Cambridge, where he studied Natural Sciences. Following graduation, he joined family firm Otter Controls Ltd and embarked on a career of invention and innovation. This started in the early 1960s as he experimented with the design of control switches using bimetal. This included the Otter G switch, a temperature-sensitive safety cut-out used in everything from cars to hair dryers. He settled in the Isle of Man in 1977 and founded the firm Strix Ltd, which turned his inventions into essential components of household items used in millions of households around the world. Strix has manufactured an estimated two billion bimetal kettle controls based on Dr Taylor's design. As well as being one of Britain's most prolific inventors, with more than 400 patents registered to his name, Dr Taylor is also a respected horologist with an extensive clock collection. He is a world expert in the work of early timekeeping pioneer John Harrison, an interest which inspired Dr Taylor to design Chronophage clocks, beginning with the three-metre high Corpus Chronophage which is displayed outside his former college at Cambridge University. Following his retirement from Strix, Dr Taylor has stayed in the Isle of Man and now lives at the stunning Arragon Mooar, which was built to his own design and includes numerous fascinating architectural features. Most notably, the house is designed around an elliptical atrium, and includes plasterwork and fixtures in the shape of his bimetal kettle switch, and this is one of the graphic devices seen in the stamps. It is also reflected in an elliptical perforation, requested by Dr Taylor and a first for the Isle of Man Post Office. Alongside his work, Dr Taylor is a philanthropist with a commitment to inspiring the next generation of engineers, inventors and innovators. He has supported the creation of the Taylor Library at Corpus Christi, the Taylor Centre at the Royal Academy of Engineering in London and the establishment of the Dr John C Taylor Professorship of Innovation in the Engineering Department of Cambridge University among other good works. He is also a major benefactor of the Teapot Trust, and all funds received by Dr Taylor from sales of this stamp issue will be donated to that charity, which works with chronically ill children in hospitals and hospices. The six stamps designs highlight these aspects of his life, featuring Chronophage clocks, his clock collection, the Otter G and bimetal kettle switches, his home Arragon Mooar and his support for education. The stamps will be issued on 13th September and the collection includes stamp sheets, an eight page presentation pack folder holding a mint set of the stamps and a First Day Cover, with a full set of the stamps cancelled with the first day of issue using a unique postmark reflecting Dr Taylor's favoured elliptical design. The envelope contains a four page information card explaining each stamp, with words written by Dr Taylor. Isle of Man Post Office is also producing a 24-page prestige booklet written by Dr Taylor which will include additional images from inside his home as well as two complete sets of self-adhesive stamps from the issue. Maxine Cannon, General Manager, Isle of Man Stamps & Coins, said: 'We are extremely proud to be celebrating one of Britain's most innovative men, and to have been able to work so closely with Dr Taylor personally to ensure this stamp issue truly encapsulates his life and career. 'The design team at Isle of Man Advertising & PR have done a wonderful job in reflecting so many graphic elements that are important to Dr Taylor and demonstrating such attention to detail in the intricate designs. Invention and Innovation – Dr John C Taylor OBE can be ordered from www.iompost.com/DrJohnCTaylor.